Kenmare News | Are you doing the Shamrock Shake? 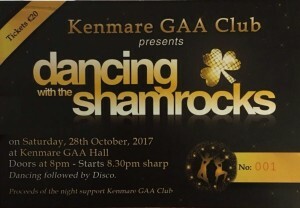 Kenmare Shamrocks GAA is going to Shamrock shake the autumn for you with the dance spectacular at the GAA club on Saturday night 28th October. Loyal club members have been dedicating themselves to dance the last few weeks in preparation for this unique event and this is all to fundraise for our new dressing rooms and ancilliary rooms at the entrance to out club grounds. Come and crush a glass with us and watch the guna’s swish and sway, see the gents as they dip and lift. Do not miss this chance! Tickets are €20 and can be bought in O’Shea’s on Main street and McSweeney’s on the square. The tickets are already on sale and are flying so don’t wait. The voting cards will also be available for sale soon. Watch this space.